Carbohydrate Loading: What is it all about? 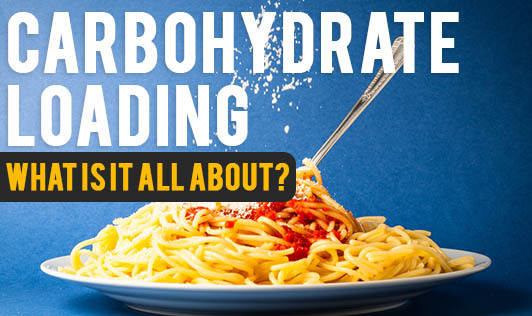 Carbohydrate loading is one of the most misunderstood terms that have put people under the impression that anyone who exercises, needs to load up on carbs. No! Carbohydrate loading is a very simple concept to improve your performance during high intensity exercises. Carbohydrate loading - What is it and what is its purpose? Back in the 1960's, this concept was introduced especially for sports such as cycling, marathon running, long distance triathlon, cross-country skiing and endurance swimming to improve the endurance and in turn performance of athletes. It is a strategy to increase the amount of fuel (glycogen) stored in the muscle by increasing the amount of carbohydrates and tapering the activity level several days before a high intensity athletic event. Every physical activity you do, needs carbs which is supplied from the stored fuel from your muscles. But, a high intensity exercise for more than 90 minutes needs a higher supply to keep you going and complete an endurance event with less fatigue. This is achieved through carbohydrate loading and isn't necessary for recreational activities. Taper your exercise before starting carbohydrate loading. Carbohydrate loading is ineffective if you are on a high intensity exercise regime. Cut down on fibers along with carbs as it will bring down your carbohydrate intake. Do not fear weight gain. Weight gain is common during carbohydrate loading. Do not eat anything and everything just because you need to load carbohydrates. Go for high - carbohydrate, low-fat foods like sugar, soft drink, sports drink, jam, honey, jelly, potato, other root vegetables and fruits. If you are exercising at a steady pace, carbohydrate loading will increase your endurance by 20% and also improve your time by 2-3%. The effectiveness of carbohydrate loading also depends on the fitness and the intensity levels. Carbohydrate loading is known to be effective in women who load during their ovulation days, as against women who load during the first or second week of their menstrual cycle. Carbohydrate loading may also cause problems like weight gain, digestive discomfort or changes in blood sugar. You may need to experiment with the amount of carbohydrates to know what suits you the best. So how about consulting a Doctor or a Dietician before starting?